Thursday July 20, 2017 – Los Angeles – This year, TheWrap is launching TheGrill in a big way. TheWrap is partnering with AMC Networks for an evening of cocktails and hard-hitting conversation with President and General Manager of AMC, SundanceTV and AMC Studios, Charlie Collier and special appearance by Comedian and Director Kevin Smith. The evening will kick off with a cocktail and networking reception at the Montage Beverly Hills Hotel on Tuesday July 25th, 2017 at 6pm, followed by a keynote conversation moderated by Founder & Editor-in-Chief, TheWrap, Sharon Waxman. 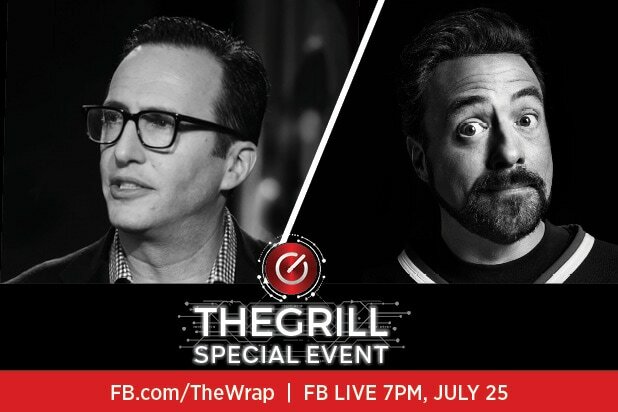 The event will be streamed live on TheWrap’s Facebook page and tweeted using the hashtag #TheGrill2017 starting at 7 p.m.
Those who purchase their tickets to TheGrill now thru July 24, 2017 will be gain access to this invitation-only event, while supplies last. Tickets can be purchased through Eventbrite HERE. Charlie Collier - Charlie Collier oversees the creative and business operations of AMC, SundanceTV and AMC Studios. Over the past ten years, Collier has transformed AMC into one of the most relevant and heralded original programming brands on television while increasing all notable business metrics. Under Collier’s leadership, AMC is the most Emmy-winning cable network in the drama series category. In addition, the network boasts basic cable’s highest-rated drama series ever for “The Walking Dead.” AMC is also the No. 1 original programming destination in all of television, home to four of the top six shows on cable last year and three of the biggest cable launches of all time. In 2015, Collier also assumed oversight of SundanceTV. Under his leadership, SundanceTV has had its strongest performance ever. With its brave, authentic and uncompromising program, the brand has undeniable pedigree and attracts some of the world’s finest talent. TheWrap News looks to facilitate a platform for hard-hitting and truthful conversations. This invite-only event will be attended by C-level executives as well as industry VIP’s and conference ticket holders. Please note: Press are invited to attend the event by Invitation Only and must RSVP.